Director of Maintenance John Merriman has the experience and training to provide an exceptional service experience. As Director of Maintenance for Mistwood Aviation Services, John oversees all service and support issues and is available to customers 24/7. 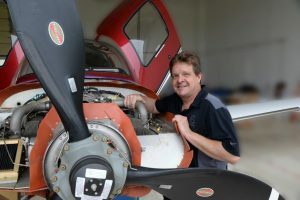 With more than 17 years of experience working on all SR series Cirrus aircraft for a number of other Authorized Service Centers, he has an intimate knowledge of these aircraft in a way that makes him an expert on the series. Coupled with his extensive factory training and relationships built throughout the industry, John can tackle any problem. We focus on making the maintenance experience easy for the aircraft owner. When dealing with Mistwood Aviation Services, you can expect daily communications and updates on the status of your aircraft. Estimates and quotes are delivered by e-mail before the work begins, and we only perform the work you approve us to do. We will be your advocate on all warranty issues, and will ensure that all necessary paperwork required is taken care of quickly and without requiring your intervention.